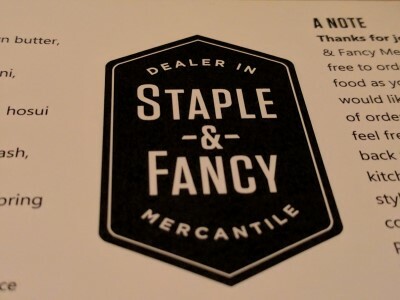 Our last meal in Seattle was the fourth Ethan Stowell restaurant we tried: Staple & Fancy Mercantile. We made reservations for a Monday evening, a little early since we were getting up early the next day, and when we arrived we were seated right away. 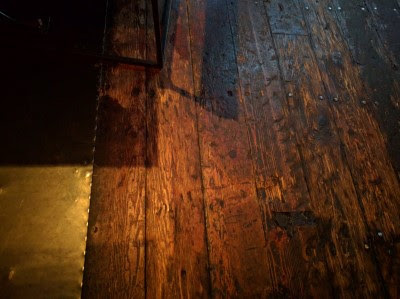 I noticed the floor right away and when I asked, they confirmed the floors were the original wood floors and that it used to be a factory (if I remember that correctly). There is an exposed brick wall with "Cigar" painted on it (one of those old, handpainted advertisements, ghost signs). Staple & Fancy has a Chef's Tasting Menu and that was tempting, but we didn't want to eat too much plus with my pickiness (no fish, no garlic) we decided to simply order a la carte. 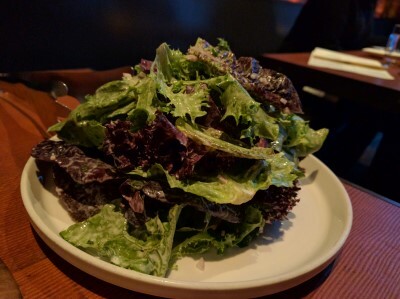 We started with Mixed Greens (champagne vinaigrette). Simple, but delicious. I was careful to not eat too much, though, because it tasted like there was quite a bit of shallot or onion in the dressing and too much of that bothers me. 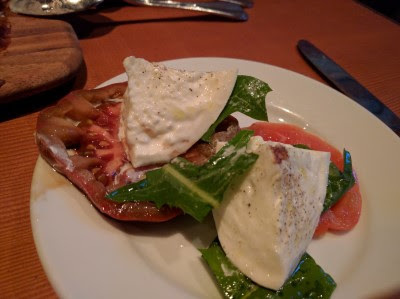 We also started with Heirloom Tomatoes with burrata and greens. Like the mixed greens salad, simple but so darn delicious. I ate more than my half because I gave SP puppy dog eyes when I asked for more cheese & tomato. I let him eat more of the salad. 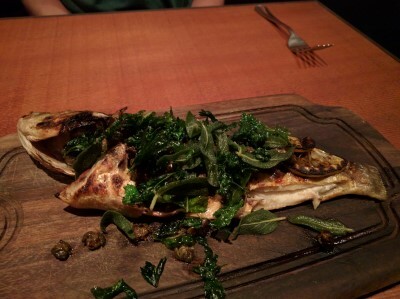 For his meal, he chose Wood Grilled Whole Fish (brown butter, capers, lemon, fried herbs). That night it was branzino. I really don't like looking at eyes on my food, or the mouth, but he seems OK with it. 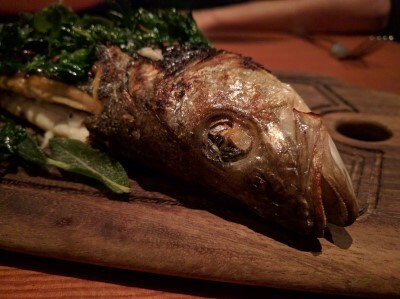 Anyway, he said the fish was delicious. 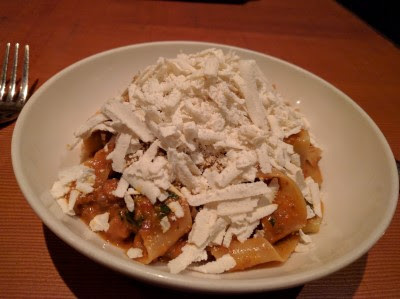 The reason I wanted to try Staple & Fancy: Papparedelle (beef bolognese, mint, ricotta salata). This was delicious, but also seemed to have a bit of heat to it. I'm not sure why since the description didn't mention any pepper or other ingredients that would cause heat. It made me think of the pasta I ate for lunch from Il Corvo Pasta but that pasta's description said black pepper-red wine sauce so I expected an intense black pepper flavor/heat. Sadly, I couldn't truly enjoy this dish because it left to much of a tingly heat in my mouth. SP tasted it, too, and was surprised. He helped me with my dish but we couldn't finish it, me because of the heat and him because he'd just eaten an entire fish. I was full and kind of sad and didn't really want dessert, but SP persuaded me to share a coffee panna cotta with a huckleberry (? some kind of red berry) topping and macadamia nuts. 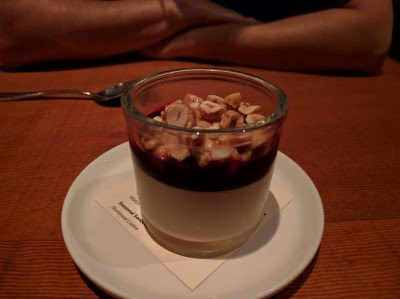 I don't like nuts and I didn't like the red fruit stuff with coffee panna cotta so I wasn't a fan of this dessert. He thought it was great. That's good, because all I ate was one bite and he was on his own for the rest. SP really liked everything. I was disappointed. I don't expect a champagne vinaigrette to be so flavored with shallot/onion/garlic, which upsets my stomach. My entree was too peppery hot. And the coffee-red fruit dessert didn't work for me. 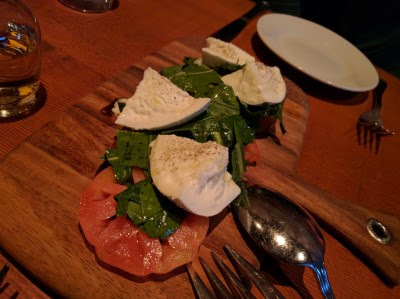 I will say it was a well paced meal, not rushed, our server was terrific, and I liked the atmosphere from the old building, the wood floors and exposed brick with old sign. I just didn't totally enjoy my food.